What I Say.....Hannah and Kate became friends in the fifth grade, when Hannah hit a boy for looking up Kate's skirt with a mirror. While they've been close as sisters ever since, Hannah can't help but feel envious of the little family Kate and her husband, David, have created—complete with two perfect little girls. What I Say.....I feel like this has been the year of infertility books. 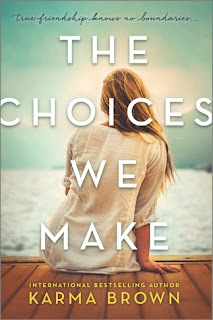 I've read Dear Thing by Julie Cohen and Saving Abby by Steena Holmes, and now The Choices We Make by Karma Brown - what a great name. So Hannah and Kate have been best friends their whole lives, and while Kate has created the ideal family, two daughters and a husband who worships her - Hannah has the doting husband, but has been unable to have a child, even after multiple rounds of IVF. Kate decides to offer her eggs and body to carry a baby for Hannah, even though it's initially over the objections of her husband. He loves that she wants to help her friend but can't help wondering what this will do to their family. Well, he's right. Don't read any further if you hate any type of spoiler, although I won't give it completely away. But I think when you have this very altruistic idea - it doesn't seem like anything could really go wrong, outside of not getting pregnant or having a miscarriage. But that's not all that happens to Kate - she experiences a significant health crisis, which threatens the bonds between the families. Some of Hannah's responses didn't ring true. Although, you can understand that she would be very concerned about the baby, it doesn't make sense that she can just disconnect her feelings or concern about Kate, in favor of an unborn child. Although, maybe it does. Thankfully, I've never known anyone in a situation like this, but it definitely could, and probably has, happened. It was a good story, but the nurse in me was annoyed with everyone ignoring the red flags of what was coming, along with the tidy wrap up of everyone's emotions. That part of the story just sucked. Because you knew there was no happily ever after for this story.